Unlike what we may think, our human existence is not complex. Apart from where we, ourselves, make it so. After all, in all our dealings and relationships with each other our outlook on everything is the result of our three mental functions that provide: fiction, nonfiction, and a choice between the two. Where such seemingly straightforward arrangement is converted to complexity concerns the element of choice, for it is our constant permissiveness to allow choice to let fiction infiltrate and deform the reality of nonfiction, and by that prevent a precise and unchanging distinction between that which is physically real and unreal. 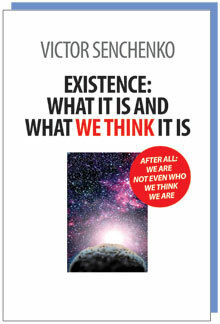 As Existence: what it is and what we think it is explains how we, humans, adore fiction  all fiction. Even if it is made up of lies, the more intricate and compelling it is the stronger we become attracted to fiction. This means we continue to allow fiction to govern our understanding of physical reality, as if unreality is reality. In order to confront this situation, Existence: what it is and what we think it is presents reason and logic to explain how we have existed with this state of events, for thousands of years, not just for no real benefit or gain to humanity, but, on the whole, a result in deterioration that threatens humanity on many fronts: from constant national conflicts, to overpopulation, to world-wide ecological degradation and irreversible climate change. And yet, despite such overwhelming proof, there is no doubt that most people on Earth would claim that: "Since everything had always went on in the same way  even if it had been from one chaos to another  why is it so important to change anything now?" And: "What is so important about knowing the difference between fiction and nonfiction?" Or: "Who cares about reality and unreality?" But then a different question can be directly presented to each and every living human being: Which one of us would prefer to live surrounded by lies rather than truth? Who would sincerely want to be plied with fiction, and make belief, and lies, never to know the truth of who they are, where they are, and who are all those other people who surround them? The answer would be... no one, absolutely no one. So now that the importance for physical reality and nonfiction had been established as a definite necessity for human understanding of themselves, another question needs an explanation: how can fiction and nonfiction be recognised for what they are, so as to be distinguished from each other? After all, Existence: what it is and what we think it is can claim that it presents explanations based on nonfiction of reality, but how can this be objectively assessed and accepted? It may appear that the ability to explain the truth of any circumstance is very complex and difficult, but in fact it only requires a stringent application of reason and logic to that of repeated observation and research. By such efforts it becomes established that there are inevitable attributes that apply to fiction and nonfiction. Fiction upholds very few, if any, physical restrictions and impossibilities, because in the realm of fiction everything is possible. Such is not the case with nonfiction, which observes the physical restrictions of physical objects and bodies and their limits of behaviour. It is, therefore, all the physical restrictions of physical existence that prevent nonfiction to accept physical impossibilities: even those accepted by current humanity and science. but more of what humans never knew, in the process obtaining an anusual benefit: a satisfaction-of-knowing. This satisfaction-of-knowing should not be presumed to be valuable from somehow becoming converted to riches, or power, or fame, or any other attribute of control-over-others that humans consider as being essential tool-of-life. Instead, as the reading of the book would show, satisfaction-of-knowing has a reward of knowing alone.